Sasha Williams says it’s hard to believe the “physical and mental fatigue” she experienced while homeless in Washington DC. Her words play over footage of Sasha cradling her head in her arms as she slumps onto a table in her small, sparse room in DC General Family Shelter. The scene cuts to Sasha hugging her young daughter Eboni. “It’s 9.37pm and it’s curfew in DC General. We won’t have no curfew when we get our own place.” Eboni squeals in response, her wide eyes bright with excitement. Sasha is one of eight homeless and formerly homeless filmmakers (above) in Washington DC who are telling their own stories of survival. “We’re trying to show that we are more than what people say and think ‘homeless’ is,” she explains. Sasha has been a vendor for local street paper Street Sense for the last year, and her film Raise to Rise was produced as part of the paper’s Cinema From the Street co-op. 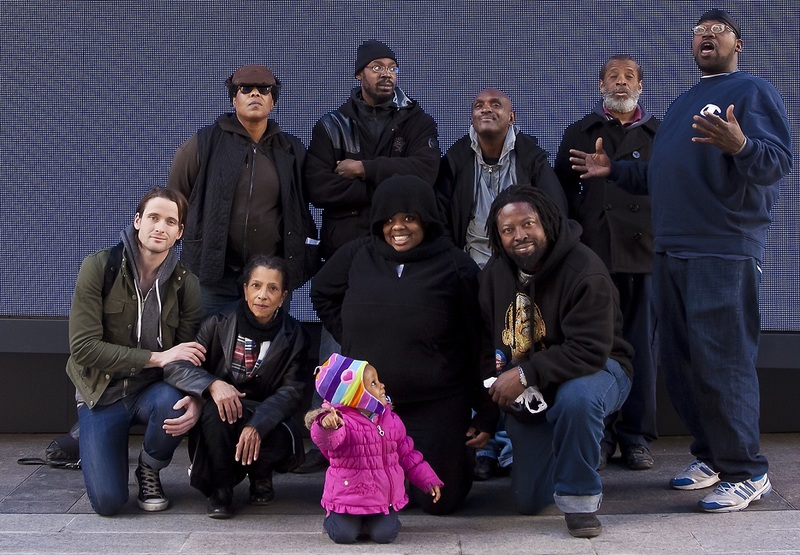 Run by filmmaker Bryan Bello and the Street Sense Media Center, the project teaches vendors cinematography skills to help them write, direct and shoot documentaries exploring homelessness in the US capital. 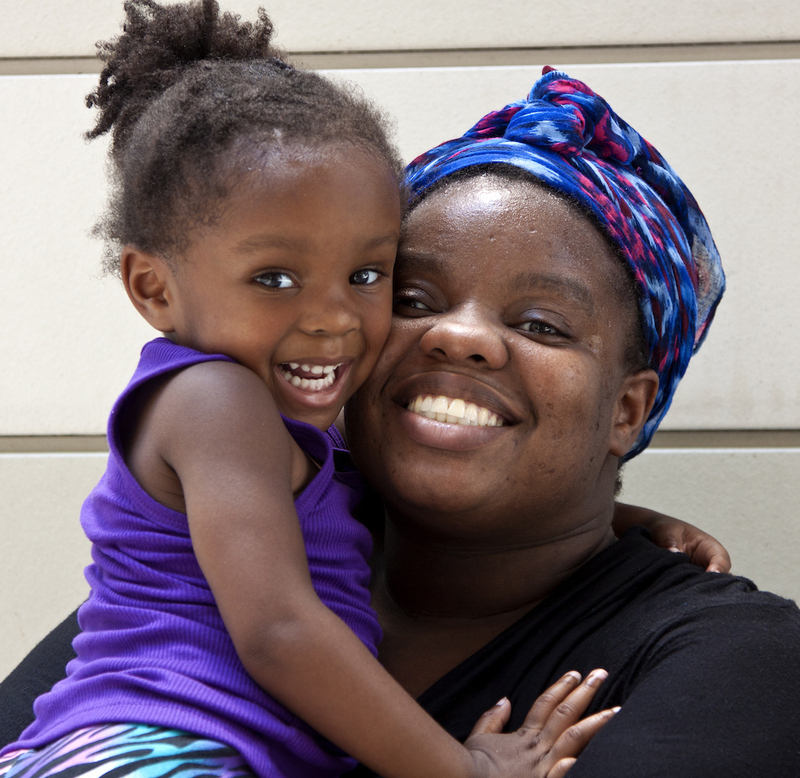 Raise to Rise documents Sasha’s time staying at DC General Family Shelter with her two-and-a-half-year-old daughter. Shot on her iPhone 6, Sasha’s video diary offers a unique inside perspective on daily life in the shelter, which is notorious for its uninhabitable conditions and structural neglect. “Everybody has their assumptions about what could be happening in DC General, so showing it rather than speaking about it lets people see for themselves what I had to go through,” she says. The family shelter was once DC General Hospital, where Sasha was born 30 years ago. In 2001, it was turned into an 288-unit emergency homeless shelter. Sasha moved in with Eboni in November 2014. “When I was there, it felt like I was in a jail. You have to sign in and out every time you leave the building, there’s curfew, there’s security officers on every floor,” she says. DC General made headlines in February 2014 when an eight-year-old girl went missing from the shelter. She has never been found. Unsurprisingly, Sasha was desperate to get her own daughter into permanent, safe housing. But being in DC General was at least better than being on the streets. Sasha became homeless in 2003. She had just completed her high school diploma in Montgomery County, Maryland but after being raped at gunpoint, she was desperate to leave the neighbourhood. Unable to speak to her mother about the horrific ordeal, Sasha felt she had no choice but to go an emergency shelter. Since then, she has spent most of her adult life living in shelters and with relatives. When she was eventually able to talk about what happened to her as a teenager, Sasha realised she was no longer a victim. “My journey is my journey, but hey, I’m a survivor,” she says. True to her word, Sasha and Eboni’s story now has a happy ending. After qualifying for government support in June, they are moving into a two bedroom flat that they can finally call home. Sasha says having the keys to her own home for the very first time was like “a dream”. “It’s a big relief. I’m still getting used to being there with my daughter. It’s the first time she has her own bedroom,” says Sasha. Sasha’s film will be premiered next week at E Street Cinema in Washington DC, along with fellow vendor Cynthia Mewborn’s self-directed documentary Whom Should I Be Grateful To? Cynthia shot parts of her film under the steps where she used to sleep in a tent. 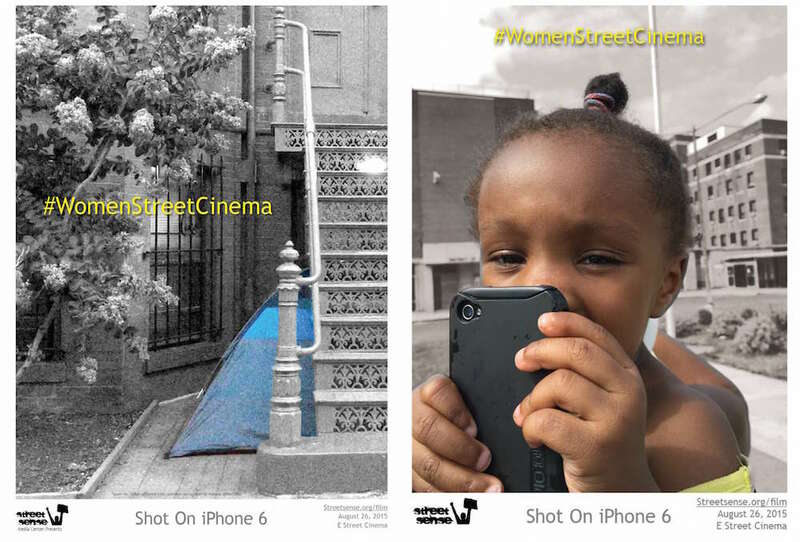 Since the films were shot on iPhone 6, Street Sense came up with a creative marketing campaign for their screening, mimicking the high profile ‘Shot on iPhone 6’ campaign from Apple (below). The screening is the second premiere from the co-op. The first three films made by Street Sense filmmakers Robert Warren, Reginald Black, Levester Green and Morgan Jones were screened in April. Sasha worked on the cinematography for Morgan’s film, Late Show, which documented his quest to become an intern on the titular US talk show. For the shoot, the entire group rented a SUV and drove to New York to film outside the Ed Sullivan Theater as Morgan tried to drum up support for his campaign. While she undertook all filming for her own production, Sasha received help from her producer and fellow co-op member Angie Whitehurst to finish her project. The project’s leader Bryan Bello says the initial response to the films has been overwhelmingly positive and that there are plans to develop the project in the future. “We wanted to find a way to make movies that guarantee a positive result regardless of who watched it. Through this co-op, people gain something from taking control of their own story and learn new skills in the process,” he says. The local filmmaker was inspired to take part in the film co-op after meeting Street Sense vendor, and now filmmaker, Levester Green. Bryan initially wanted to make a documentary about Levester but quickly realised that giving vendors the ability to tell their own stories would have a far greater impact. “The information and energy you get is something I don’t think could be replicated by a professional filmmaker coming from the outside. Getting to control the stories themselves made these projects stronger,” he adds. Following this year’s INSP Global Street Paper Summit in Seattle, Street Sense hopes to partner with Boston-based street paper Spare Change News to get the vendors’ films shown on public access TV. Bryan met Spare Change News editor Sam Baltrusis at the Summit in June, where they both made presentations on their street papers’ inventive media projects. They are now working together so that the Cinema From the Street co-op can contribute to Sam’s weekly TV show Spare Change News TV (SCN-TV), which airs on Cambridge Community Television on Monday evenings. Like many street papers, Street Sense has a strong history of providing its vendors with creative outlets and learning opportunities. “Street Sense is my foundation,” says Sasha. 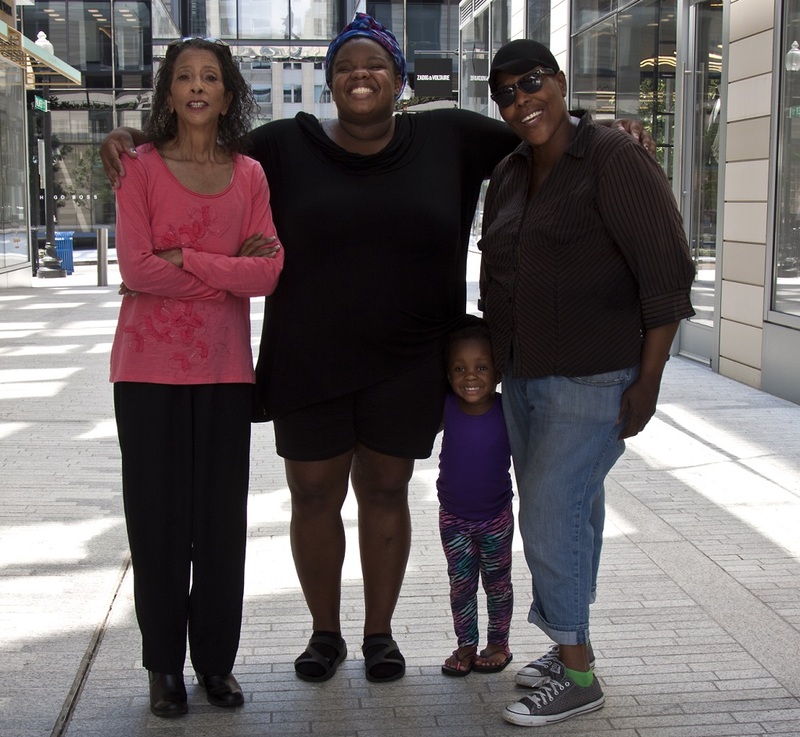 She adds that being able to share her experiences of homelessness through writing, theatre and film projects offered by Street Sense has helped her voice become louder. Sasha hopes the films produced through Cinema from the Street will challenge audiences’ misconceptions about homelessness. “Some people think ‘the homeless’ are just this one character. I want them to see that people are trying to do something with themselves,” she adds. Sasha Williams and Cynthia Mewborn’s Cinema from the Street will be screened at Landmark E Street Cinema in Washington DC on 26 August, 6.30 – 8.30pm. The event includes a Q&A with the directors, moderated by author and activist Marita Golden. More info here. You can watch Cinema from the Street films now on Vimeo. Photos by Jane Cave, a member of the Street Sense Photography Class.